Listen, I will cop to it right now: I am a Female-American. My mother was a Female-American, and her mother and her mother... well she was French-Canadian. But the point is, I come from a long line of people with vaginas, and happen to be a lady myself—and I also work in the world of cars. This is ongoing problem in tech, as companies like Google and Uber face high-profile harassment complaints and come under pressure from the public and investors to hire more women and people of color. Women only make up 25 percent of computing jobs and only 11 percent of leadership roles in Silicon Valley, according to Business Insider. Women also quit tech jobs at twice the rate of men. That may have something to do with their earnings, which tend to be almost 30 percent lower than men’s. One radical fringe that is growing is Mgtow, which stands for Men Going Their Own Way and pronounced MIG-tow. Mgtow aims for total male separatism, including forgoing children, avoiding marriage and limiting involvement with women. Its message boards are brimming with activity from Silicon Valley. The entire piece reads like an /r/TheRedPill rant, and without a lot of refutation of these claims. Here is where cars get involved: Jon Parsons, a lawyer representing men in a class action lawsuit against the company, called out women in the auto industry specifically. Parsons used a former Yahoo Autos editor as a symbol for how ridiculous the gender wars in tech have become. He said that his clients, Greg Anderson and Scott Ard, had faced gender discrimination in Yahoo’s media teams and that other teams like cars were headed by women, which to Mr. Parsons was a sign of problems. Parsons doesn’t say who it is, but I will: it’s Sharon Silke Carty, now an editor at Automotive News and a friend of this site’s. She was mention by name in another previous article the Times published on the lawsuit that Parson filed on behalf of laid-off male employees in its entirety. Carty, also a known woman, has worked for the USA Today, covered cars for the Associated Press, the Detroit Bureau, Autoblog, Yahoo Autos and is now an editor and writer at Automotive News. She was among the first to publish reports of what was happening on 9/11 because there were stories that needed to be told. 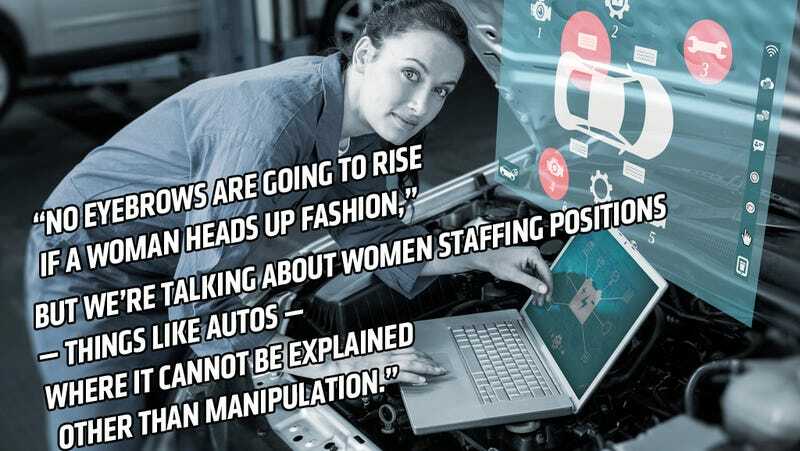 But the very idea that this chick was in charge of something so man-centric as automotive news is apparently ridiculous—something that could only be explained as “manipulation.” Cars are just not something girls know about or like! It’s so deeply unfair to the “low-performing” males who were laid off that she was put into this position. No matter how much of Carty’s professional life has been spent in cars, Parsons, Damore and their ilk won’t be persuaded into seeing women like her as people, let alone as equals in the workplace. Clearly this is political correctness run amok, not that she, a woman, might be qualified for the job. I’ve been a car nut my whole life, and have written about cars and transportation for the better part of a decade. I worked my way up in the world, from several unpaid internships, marketing work (dark days indeed) to managing editor of the most-read and best car enthusiast site on the internet. During my time, I’ve worked with both men and women, public relations people and managers. I’ve lived this life; it’s not theoretical to me. The saddest part about this story isn’t that, in 2017, a lot of men still view women in this manner in the workplace. It’s that Carty, and the vanishingly small percentage of women who do work in auto and tech, have all experienced this kind of attitude at one time or another to the point that it is normal for us. When Carty first became my Editor-In-Chief at Autoblog, Carscoops immediately discounted her as a “mommy blogger.” She oversaw months of interesting stories and hard work before leaving for the same position at Yahoo Autos. But no matter what she accomplishes, she will never be a professional, or even a whole person, to some. She has been discounted, over and over again, before she could even put words to page. So here’s my message to you Red Pill jackasses: Women just don’t care that much about you. You obsess over our movements, our strategies for keeping you down, when really, we can’t be bothered. Women won’t debate you because your ideas have been held below the threshold of reasonable for so long that the bubbles have stopped. We’re not here so we can make sure someone with a Y chromosome can’t be. Women in automotive don’t get together and talk about ways to make sure we keep boys out of what is, statistically speaking, still their club. We’re here to work hard and talk about cars. But don’t take my word for it; I’m just a girl.